Key to activate and utilise the flexibility of robotic systems is their programmability. Our software solutions exploit these capabilities, while reducing the complexity of programming. Adjusting robotic systems to modified outputs and processes can therefore be performed by non-experts in a fast and efficient way. The software incorporates parameters of the robotic fabrication process already in the design phase, exploiting the capabilities of the robot to effortlessly position each individual brick differently. The data produced is directly used to control the fabrication process without the need for additional process programming of the robotic system. Thereby, facilitating the efficient and highly flexible automated production of non-standard brick facade elements. URStudio is a software environment for off- and online programming of Universal Robots offering bi-directional communication. Its main feature is controlling the Universal Robot directly from data, allowing for accurate path planning. Thereby easing complex task programming through a unique combination of teaching and manipulating virtual geometries. All without the need to descend into programming machine code. Built upon a modular platform, URStudio is a platform that can easily be customised for specific Automation tasks. 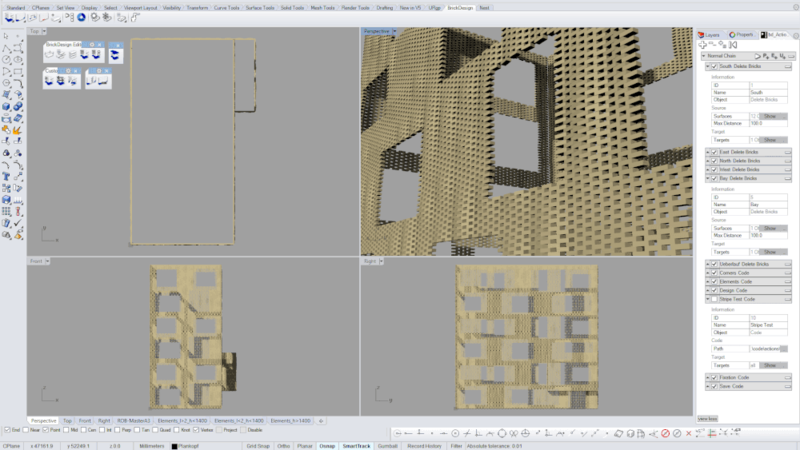 WoodFlex is an extensive simulation and control software for robotic timber construction. The software encompasses an off- and online control for the WoodFlex 56 gantry robot, including, configuration, simulation, collision detection and visualisation of the robotic system. It operates directly of BTLx input data, the industry standard CAD interchange format for timber construction, framing and carpentry. Thereby, eliminating the need to re-programme the machine for every new fabrication task. The BTLx Editor is a universal editor for the industry standard interchange format BTLx. The software offers a fast and easy way to view and edit the parametric description of the building components’ geometry, their processings as well as structural information for prefabrication and assembly. This allows to realise small fabrication adjustments without the hassle to rerun the whole project through a CAD/CAM pipeline. Interested in Tailored Software Solutions? The development and provision of software solutions is our core business. Built upon a modular software architecture, we can compose individual software tailored to your specific needs. Our software can be applied to a wide range of different applications and manufacturing scales. Our newsletter will be sent in sporadic intervals.